If you have been hit from behind in a car accident, you are not alone and you should immediately seek the advice from an experienced car accident lawyer in Baton Rouge. Rear-end collisions are the most common type of car accident. They are also the most common cause of whiplash, a painful and potentially disabling neck, and back injury. Babcock Trial Lawyers can help set things right after you have been injured in a rear-end car accident in Baton Rouge or anywhere in Louisiana. We will aggressively seek compensation to reimburse you for your medical expenses, lost income, pain, suffering and more. Don’t wait to take action after a car accident call a personal injury lawyer Baton Rouge now. Stephen Babcock and Chase Tettleton are accomplished personal injury attorneys in Baton Rouge, having been named among the U.S. News & World Report Best Lawyers in Personal Injury – Plaintiffs every year since 2011. Their reputation means that insurance companies take your claim seriously as soon as they hear Babcock Trial Lawyers’ name. Our objective at Babcock Trial Lawyers is to obtain the maximum compensation available to you after a rear-end accident. We’ll meet with you to discuss your case and legal options in a free case review with no further obligation from you. If we take your case and it does not end in a payment to you, you do not owe any fees or costs of any kind. If you are not 100% satisfied, terminate us within 30-days and you won’t owe us anything at all. Nothing. No costs. No attorney’s fees. No kidding. If you were hit from behind, the other driver was almost certainly at fault for your rear-end accident and injuries. The financial burden of an accident someone else caused should not fall on you. The car accident attorneys at Babcock Trial Lawyers can make the difference. Here are the most common injuries faced after a rear-end collision. One of the more common rear-end accident injuries is whiplash. Whiplash happens when the head is jerked back and forth with a lot of force. The exact kind of motion that a rear-end collision creates for those in the car that gets hit. It’s the same kind of injury you see in contact sports, such as hockey. Left untreated, whiplash can leave you vulnerable to long-term, chronic pain. It can be easy to blow off a stiff neck or headaches following an accident. You expect to hurt a little after another vehicle hits yours. If you think you have whiplash, be proactive and speak with a physician. It could save you years of pain. One of the more severe rear-end accident injuries is traumatic brain injury or TBI. A traumatic brain injury is often a result of a blow to the head, like banging your head against the steering wheel. Part of what makes TBI so problematic is that the injury happens where you can’t see it, inside your own skull. You can see the blood when your arm gets cut or the bruise on your chest from the seatbelt. Your body hides it if your brain is bleeding and bruising. That’s why it’s essential to pay attention to behaviors after a rear-end accident. Mild TBI usually resolves itself with some rest and time. More severe TBI often requires a lot of medical care. You may need anything from medications to surgery to limit the long-term damage. Bones get broken in rear-end crashes in a lot of ways. Sometimes, the crash is violent enough that your seatbelt ends up cracking ribs. If you have loose objects in the car, the crash can throw one or more of those objects into you. If your hands aren’t firmly on the wheel, the impact could whip your arm or hand into something solid. The odds of this happening vary for a lot of reasons. The odds of someone’s bones breaking vary for a lot of reasons. Someone with a good diet who gets regular exercise will have healthy bones that are less likely to crack or break. Children tend to have much more flexible bones, which means their bones are less likely to break. That becomes a double-edged sword because it also means you’ve got to be very conscious of soft tissue damage. Bones become more fragile as you age, so the elderly are much more likely to suffer broken bones from an accident. Bone fractures come in several varieties, it’s best to get any suspicious pain checked out. Of all the potential accident injuries, spine injuries are some of the scariest. A broken bone will mend. Bruises will fade. A spine injury can change the way you live your life forever. The first three create a substantial amount of pain and may require surgery to correct them. Spinal cord injuries are on a different level. Treat any back pain after an auto accident as a very serious matter. If it persists, seek medical attention. Despite the use of safety glass and tempered glass in car windows, lacerations are very common rear-end accident injuries. Part of the reason for that is because so many things can cause them. Any loose object with an edge or a sharp corner can cut the surface layer of skin. A heavy object, such as a briefcase, may hit at an angle and essentially grind the skin off. Surface lacerations are often painful, but generally treatable with bandages, stitches, and antibiotics. Some lacerations go deep enough to damage arteries, veins, tendons or ligaments. These injuries generally require surgery to repair them. Car accident injuries, broken bones, and whiplash come to mind first. But did you know that car accidents often can cause significant knee injuries as well? One of our clients was injured in an automobile accident while visiting Baton Rouge on business. He was driving a rental car and was rear-ended while stopped at a traffic light. The injuries caused tens of thousands of dollars in medical expenses. Along with the usual soreness and post-accident aches, our client also suffered a tear to his medial and lateral meniscus, the cartilage structure that comprises a large part of the knee joint. The knee is the largest joint in the entire body. When it’s been injured, the effects are painful and debilitating personal injury. Common symptoms of a torn meniscus include severe pain, swelling, “popping” of the joint, and extreme instability which sometimes causes the knee to “give out.” For our client, the pain was excruciating and interfered with his daily activities for months. We made sure he found the appropriate medical treatment. Some minuscule tears can be watched and treated with physical therapy and muscle strengthening to stabilize the knee joint; however, this client required arthroscopic knee surgery and the injury accelerated the necessity of a full knee replacement. The car accident lawyers at Babcock Trial Lawyers handled this client’s personal injury case from start to finish. After negotiations with the at-fault driver’s insurance company failed, we filed suit and pushed the case to trial. Ultimately, we obtained a positive settlement through mediation a week before trial. Our client’s medical bills were reimbursed through settlement and he recovered fair compensation for his pain, suffering, and aggravation. Rear-end accident injuries are unfortunate and common. They can be as mild as a small cut or as serious as paralysis. If you’ve been injured in an accident, the most important thing is to seek medical attention as soon as possible. Prompt treatment can often reduce or prevent some of the worst long-term problems. You also want to seek treatment as soon as possible so you have an accurate record of your injuries. While it might not be a concern in the immediate aftermath, you could be facing serious medical bills over time. Accurate medical records make it harder for insurance companies to get out of paying those bills. Babcock Trial Lawyers specialize in personal injury law. If you’ve been injured in a rear-end accident and need some help making things right, contact us for a consultation today. Contact our Baton Rouge Rear End Auto Accident Attorneys Today! The experienced personal injury lawyers at Babcock Trial Lawyers strive for positive outcomes in all of our personal injury cases. Contact us today to see if we can assist you with your matter. Why Seek Legal Help After a Rear End Accident? When one car strikes another in the rear, it is typically because the car in front has lawfully slowed or stopped. The sudden impact of a rear-end collision on the car in front forces its driver’s and passengers’ bodies sharply backwards, then forward. When they are restrained by seatbelts, their heads and necks quickly snap forward and backward. This sudden jolt can damage joints, disks and/or ligaments of the spine, which is a serious injury known as whiplash. If you have been in a rear-end accident, you may have whiplash. You may have other injuries caused by the impact of the crash and being slammed into the vehicle’s dashboard, seatback or other structures. You may recover from whiplash or other sprains, strains or fractures (broken bones) after several months. But it is also possible that your injuries have caused damage that will lead to lasting (chronic) pain. Regardless, you deserve some compensation for what you have been put through. You deserve to be repaid for the financial and personal costs of being injured, including requiring medical treatment (including hospitalization), having your property damaged, being laid up and put out of work, etc. You may wonder why or how this happened to you. Essentially, the driver behind failed to recognize that you had slowed down or stopped, and did not brake or swerve in time to avoid hitting you. Intoxication causes slower reaction time, poor coordination and inattention that contribute to about one third of all car accidents, including rear-end collisions. A driver’s attention to cell phones and texting, other electronic devices, others in the vehicle or something outside of the vehicle for even a moment is a distraction that can allow a rear-end accident to occur. Fatigued, drowsy or sleepy drivers, like drunk drivers, have reduced ability to recognize and react to a vehicle that has slowed or stopped ahead of them. Speeding and following too closely make it more difficult to stop or turn a vehicle in time to avoid a rear-end collision. Each of the causes of rear-end collisions above are violations of Louisiana traffic laws. A criminal conviction is not necessary for a successful personal injury claim, but a claim does have to show that the defendant (usually the other driver) was at fault. For this reason, it is important to go to the criminal trial of the person who hit you if the district attorney prosecuting that case asks you to. In a few cases, a rear-end collision is not the other driver’s fault. In some cases, the driver’s car has failed, for example. The car’s brakes may have failed due to faulty design or manufacturing. In such a case, a claim could seek compensation from the car and/or brake system’s manufacturer(s). Part of the work Babcock Partners does for car accident clients is to investigate all possible causes of your crash. This allows us to properly identify who should be held accountable for the harm that you or your loved has suffered. It allows us to seek the compensation for you that you deserve. 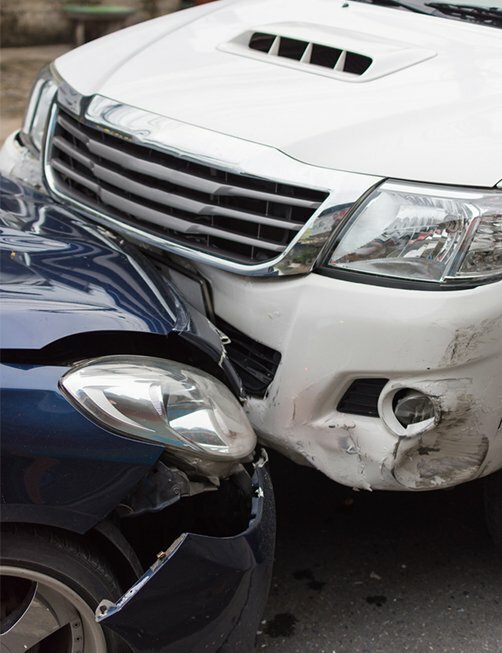 How Do We Determine Fault for a Rear End Collision Claim? If the other driver was charged by the police and convicted of a violation in your rear-end collision, that is helpful for your claim. However, not every rear driver in a rear-end collision is ticketed, and certainly not all are convicted. As we noted above, not all drivers who hit someone from behind are at fault. Several of the key pieces of evidence in a car crash case are time-sensitive. They may disappear naturally (such as crash scene evidence) or purposely, such as when a “totaled” car is junked and dismantled or crushed. To obtain some types of evidence, such as cell phone records, it may be necessary to obtain a court order. The need to gather evidence while it is available makes it important to start a car accident investigation as soon as possible after a crash occurs. A thorough investigation of your rear-end car accident is just one of the services Babcock Trial Lawyers provides free of charge unless and until we obtain compensation for you. And, if you are not 100% satisfied, terminate us within 30 days and you won’t owe us anything at all. Nothing. No costs. No attorney’s fees. No kidding. Nothing. We are here to help you get your life back in order after a rear-end collision has turned it upside down. We can’t undo your injuries, but we can seek the compensation you are owed for what those at fault for your accident have done to you. If you have been badly injured in a rear-end accident, you may have already heard from an insurance adjustor. You may have already received a settlement offer. The adjustor may be from Baton Rouge or elsewhere in Louisiana and seem like someone you should be comfortable dealing with. We can tell you from our years of handling car accident cases and dealing with insurance companies, any settlement offer made quickly after an accident is usually incomplete and too little. It’s as simple as this: Unless you have fully recovered or received final release from doctors, and you have a full accounting of every dime spent or lost because of your accident, you cannot know how much you should be paid by insurers. In some cases, such as if you were rear-ended by a drunk driver, we may also seek punitive damages. Punitive damages are additional compensation paid to you as a punishment and as a statement about the defendant’s egregious behavior. Babcock Trial Lawyers will also work to identify all insurance coverage applicable to your case and seek compensation from every available source of payments. As your legal advocates, Babcock Trial Lawyers will vigorously challenge any undue blame the insurance company tries to put on you. We don’t back down from unreasonable insurance adjusters. We have seen their tricks before. We are here to fight for your interests.